What do you know about kissing? This is a fun little infograph with some trivial information that will bring a smile to everyone’s face at your next party. Get smarter by reading this article then flaunt your intelligence. Our brains have special neurons that help us locate each others’ lips in the dark. Men who kiss their wives in morning live 5 years longer than men who don’t. 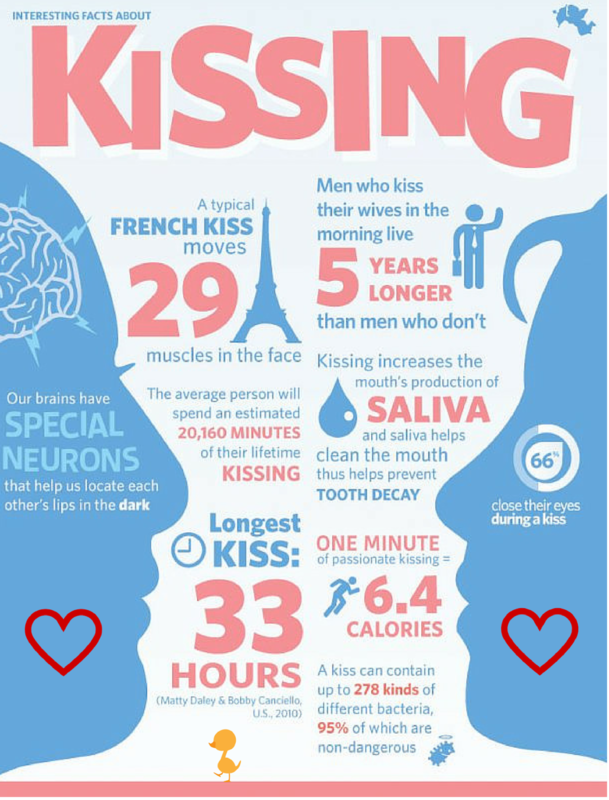 A typical french kiss moves 29 muscles in the face. The average person will spend an estimated 20,160 minutes of their lifetime kissing. One minute of passionate kissing burns 6.4 calories. 66% close their eyes during a kiss. The longest kiss: 33 hours. I have no intention of being a world record holder, but who couldn’t use a little “work out” now and again. We were surprised by a couple of these facts, how about you? Share you comments below.